Located close to Downtown Etobicoke, with restaurants and a shopping mall within walking distance. Clean and spacious rooms, efficient cleaning staff, friendly hotel staff. Accommodated a late check-out (+2-3 hours) with a small extra fee. had no problems calling cabs via the reception. It’s about 1km off the 427 , close to shopping ( mall ) and restaurants (walking distance ) , the staff is cool , the price is right 78$ USD ,,, rooms are clean AND.... they have smoking rooms !!!!! We also got the jacuzzi suit and it had a sauna which was a big plus !! 100$ USD. Not very much. last minute choice. you get what you pay for. Front desk lady was nice and changed our smoking room to non smoking. It was right next to Tim Hortons for breakfast, it had big rooms. It was alright for the money. Location was good just off the Queensway, had a fridge and microwave and a queen bed. The room- and bathroom-size was okay. The bed was comfortable. Deluxe Inn This rating is a reflection of how the property compares to the industry standard when it comes to price, facilities and services available. It's based on a self-evaluation by the property. Use this rating to help choose your stay! One of our top picks in Toronto.This hotel is located in Etobicoke, just a minute's drive from the Gardiner Expressway and the QEW. Downtown Toronto is 9.3 mi away. 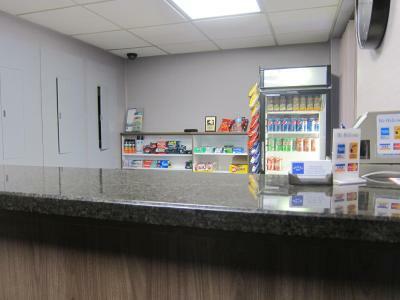 Free WiFi, cable TV, a microwave and a refrigerator are available in each room at the Deluxe Inn. All rooms have a private bathroom. 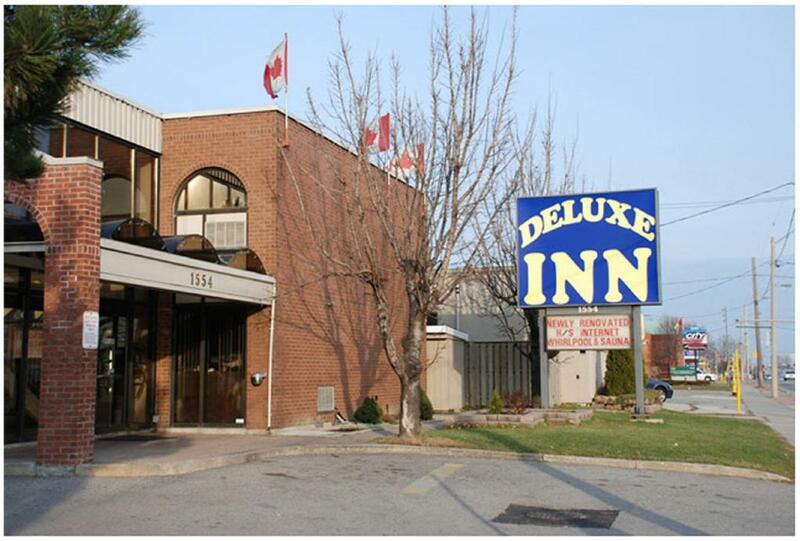 Deluxe Inn is 7.5 mi from Toronto Pearson International Airport. Sherway Gardens shopping center is 1.1 mi away. When would you like to stay at Deluxe Inn? This nonsmoking room offers free WiFi, a sofa, a 40" flat-screen LCD TV, complimentary local calls, an alarm clock/radio and a hairdryer. In addition, guests will find a mini fridge and microwave in the room. 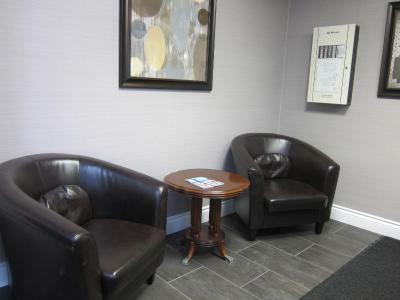 Ideally located in Etobicoke, Toronto, our airport hotel is the perfect solution for visitors looking for affordable, comfortable accommodations in the Greater Toronto area. Perfect for guests with overnight flight connections as well as business and leisure travellers, our hotel features convenient hotel amenities and newly renovated rooms at unbeatable rates. Deluxe Inn Toronto is just 10 minutes from Toronto Pearson International Airport, and 15 minutes from Toronto and Mississauga’s top attractions. House Rules Deluxe Inn takes special requests – add in the next step! A CAD200 damage deposit is required on arrival (around USD149.15). This deposit will be fully refunded at check-out, as long as there isn't any damage to the property. Deluxe Inn accepts these cards and reserves the right to temporarily hold an amount prior to arrival. A damage deposit of CAD 200 is required on arrival. That's about 149.15USD. This will be collected by credit card. You should be reimbursed on check-out. Your deposit will be refunded in full by credit card, subject to an inspection of the property. Heating and air condition is very noisy, old equipment. Good location, close to the airport, free parking. The paper towel roll was almost done. I like the design of the room , the bed , the tv and the internet. Was no breakfast . No coffee machine. The room smelled of mold. Water damage was visually evident. There was yelling from other rooms. The property had alot of garbage laying around. We did not have a desk or bedside table lamp, only the overhead light which was very bright. Beds were comfortable and hotel staff friendly. Threadbare sheets, small room, kind of run down. In need of updates. As expected. Nothing fancy. Clean and good beds.